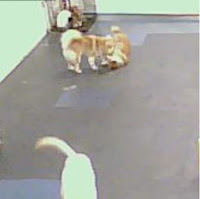 Maya spent a day at doggie daycare today. Not because I can't be around for her, but because the facility requires a day at daycare within three months in order to board her, and we are planning to go on a trip next month. The requirement is a bit annoying, but we really like that place. 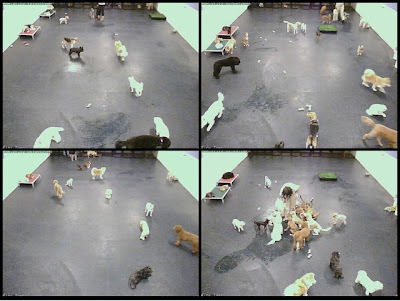 They have a webcam set up to monitor the pups online, and even published their own iphone app to stream the video, which is really nice for owners who are traveling. They also always have a trainer (sometimes even two or three) with the dogs and constantly interacts with them. The only complaint I have is that they don't have an outdoor area (because of the city law), so all dogs pee and poop in the room. The first time she boarded there when she was only 10 months old, I was afraid she would get into a bad habit of potty indoors, but fortunately nothing changed when she came back. They do have a potty patch, but seems like Maya refuses to step on it and would just go at ramdom places. I guess it must be kind of painful for her. 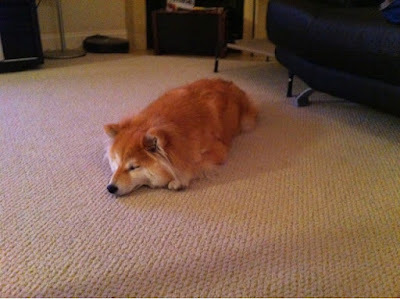 Unlike her previous visits, which were almost an year ago, she didn't have much interactions with the other pups today. She used to be tangled up with another dog throughout the day, but somehow she just walked around "cluelessly" this time, which made me feel like we are wasting money. We did notice this similar behavior at dog parks as well. It seems like as she age, she has less interest in other dogs. She still gets excited to see them, but once she's done with the sniffing and greeting, she's off to do her own thing. Even though she didn't play much, at least she's not stressed in the environment and enjoys the company of the trainers as well as other dogs. Next time she'll be there for five straight days, and it's good to know she'll be in good hands.